Graduating students Yolanda Wilson ’18EDD and Armando Salazar-Cardoso ’18 will deliver the keynote addresses at the NC State College of Education’s December 2018 Graduation Ceremony Wednesday, Dec. 19. A student in the Doctor of Education in Adult and Community College Education program, Wilson will deliver the Charge to the Graduate Students. She has worked for the community college systems in North Carolina and South Carolina for over 20 years. 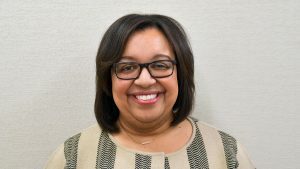 She began her career as a faculty member in English, and is now the associate vice president at York Technical College in Rock Hill, South Carolina. A science education major, Salazar-Cardoso will deliver the Charge to the Undergraduate Students. During his time at NC State, he has served as president of the GLBT Community Alliance and has worked as an orientation leader, Summer START mentor and Zumba, cardio dance and cycling instructor with University Recreation. He was also a mentor through the Students Advocating for Youth (SAY) Living and Learning Village. He plans to teach middle school science. 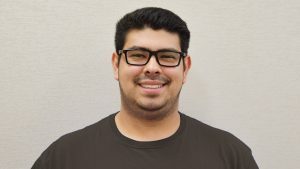 During his time at NC State as a science education major, Armando served as president of the GLBT Community Alliance and worked as an orientation leader, Summer START mentor and Zumba, cardio dance and cycling instructor with University Recreation. He was also a mentor through the Students Advocating for Youth (SAY) Living and Learning Village. He plans to teach middle school science. What It Means to Deliver the Charge to the Undergraduates: To me, this means that my ideas and my voice have meaning. I am honored to be able to represent my class in front of our friends and family. Throughout my time at NC State University, I thought about what I would say if I got the chance to speak at graduation, and now I will be able to say those things I thought about. What I Hope Others Takeaway From My Charge: I hope graduating students will take away that even though we may each be very different teachers from each other and our mentors, we will still be great educators because of our passion for the profession. I hope they take charge and make education what they think it should be. My Message to Alumni: My message to the alumni would be that we, the graduating educators, have a great passion for education, and we will work alongside them to move this profession forward and into the future. Why I Chose Education: I believe many children do not have the resources or are not in the position to receive the education the everyone deserves. I want to help provide quality education to everyone in our country and around the world. Education is very important in the advancement of society, and we need to ensure that everyone that wants to be a part of that advancement has the resources needed to be a part of it. Something I Will Never Forget About My Time at NC State: The one thing that will stay with me forever was something the great Professor Candy Beal said in one of her classes. She told us to remember that when we wish for snow days because we need a break after half a year of teaching, some of our students will be dreading a snow day because school may be the only place where they get to eat. This message was so impactful to me and made becoming a teacher even more important than before. How My Time at NC State Changed Me: I have become much more confident in myself as well as aware of my needs and beliefs. While here I was able to find out what I truly wanted to do with my life and helped me find my voice. Before NC State I had so many beliefs I had to keep quiet due to not being brave enough to stand up for them, but I am finally able to stand up for what I believe is right. I was able to experience so many amazing experiences and have become a more knowledgeable member of society. NC State has made me a better person and has helped me find my true self. What’s Next: Next for me would be to spread the love and joy of science by teaching middle school students. I hope to one day go into counseling, but I will leave it up to life to take me where I am meant to go within education. Yolanda is a Doctor of Education in Adult and Community College Education graduate. She has worked for the community college systems in North Carolina and South Carolina for over 20 years. She began her career as a faculty member in English, and is now the associate vice president at York Technical College in Rock Hill, South Carolina. What I Hope Others Takeaway from My Charge: To enjoy the moment — as it is indeed a special time – but to remember that as Wolfpack graduates — we are expected to not only think, but to do. I hope that my fellow graduates will see the charge as a call to action — as a call for “doing.” As teachers, researchers, policy makers, administrators and community advocates, we cannot become complacent with the status quo; we must challenge ourselves and others to do more to advance educational access and success for all. My Message to Alumni: You are such an inspiration to us! The College of Education alumni I have the pleasure of knowing are doing incredible work in the field and I am always inspired by their contribution. Why I Work With Community Colleges: I began my community college career as an adjunct faculty member, working in developmental education, with a sincere desire to help adult students who needed a workforce credential to support themselves and their families. And although I began my career in the community college system with this heart for students, I could relate to their journey even more when my own husband, after a work-related injury, chose to enroll at a local community college to rethink his career options and ways to support our growing family. It was after witnessing, firsthand, the impact a community college can have on one’s life that I knew working at a community college would be more than a career choice, it would be my life’s work. Why I Chose to Pursue a Doctoral Degree: I firmly believe that lifelong learning is essential — especially if you decide to work in the field of education — as you must grow in order to support the growth in others. For me, getting a doctoral degree was the next step in my lifelong learning pathway, in part, because I love to learn, but also because I understand that in order to grow professionally as a community college leader, having a doctoral degree is a must. What I Have Learned at NC State That I’m Applying to My Career: My time at NC State College of Education impressed upon me more of a way of thinking, than any one particular thing. Through this experience, I have learned to ask the hard questions, not be afraid of what those answers reveal, and most of all, to do something about it! NC State faculty not only encouraged me to identify the pressing issues in community colleges, but they challenged me to think through the solutions. They wanted us to apply the principles we learned in the classroom to a real context. So, in my work, I do just that. What I Set Out to Learn During My Dissertation Research: I have always been interested in how adults learn, the factors within the classroom environment that best supports that learning, and instructional strategies that accelerate course completion. Having worked with the initial developmental curriculum redesign in North Carolina, I was incredibly interested in the impact of other acceleration strategies, which mitigate the need for prolonged remediation while supporting students through critical gateway courses. To this end, my research examined the effectiveness of a co-requisite mathematics model for Pre-Calculus students at one large urban community college in the southeastern region. What I Learned from My Dissertation Research: Accelerated curriculum redesigns are important to advancing student success and the completion agenda, but developing a redesign with an infrastructure for implementation alone is not enough. Conversations about adult learning strategies, strong andragogical approaches, and culturally responsive teaching must be at the core of each redesign effort to support equitable outcomes for all students. Simply put, candid discussions about effective teaching and learning must be at the center of these curriculum conversations to move the needle on student success. And these conversations cannot happen among administrators and full-time faculty alone; part-time faculty as well as instructional developers, both incredible resources for community colleges, must also be engaged in the broader dialogue and included as part of the solution to truly make an impact. What’s Next: To enjoy the moment and share it with my family and friends! But I’d also like to continue my growth as a community college administrator and contribute – in even greater ways – to the mission of this important work.